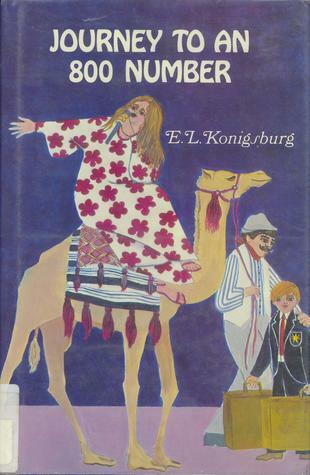 E.L. Konigsburg is one strange lady. I've read enough of her books by now to know to expect some weirdness, but I think Journey to an 800 Number is by far her most unusual book. And also possibly one of the best. Rainbow Maximillian Stubbs (sometimes called Bo, and sometimes called Max) normally lives with his mother, but she has just married a rich man named F. Hugo Malatesta the First and is on her honeymoon. Bo is therefore sent to travel with his dad, who roams the country selling rides on his camel Ahmed at fairs and conventions. While on the road, Bo clings to his jacket, which bears the crest of the fancy school he will attend in the Fall on his new stepfather's dime, using it as a testament to his brains and status in the world. As the days go by, however, his eyes are opened to the rest of the world, and he starts to make connections with people he previously would have seen as beneath him. In particular, Bo connects with a girl named Sabrina, who goes to various conventions with her mother under assumed names. Sabrina collects information about freaks and is obsessed with the idea that every normal person pretends on a regular basis, while only freaks can be themselves all the time. The entire book is an exploration of identity and the various masks people wear to conceal who they truly are, or to blend in among those they would choose to befriend. This is a really sophisticated children's book, and the only books I can think to compare it to are adult books. (Flannery O'Connor is the main author who came to my mind. I also kept thinking about Fight Club.) I don't even know who I'd recommend this book to. It's as old as I am, and thanks to references to parents who were hippies, parts of it are dated, and some of the slang didn't even really make sense to me. The main character also acts much older than his intended age, to the point of making very adult observations about the world around him. I don't think kids would necessarily see themselves in this story, or even know how to approach it. The writing is typical Konigsburg, though. It has this certain attitude about it, and it's filled with these little throwaway lines that are actually quite brilliant insights about life. I have no idea where she gets these strange ideas for characters and settings, but I'm glad she has them, and that she writes them down. I'm not sure who the audience would be for a book like this now, but despite all its strangeness, I really liked it, and I'd be really curious to hear other opinions. I haven't read this book of Konigsburg's, though I've read most of her others, so thanks for pointing it out. The one juvenile author it made me think of, based on your description, is Ellen Raskin (especially Figgs and Phantoms, but most of her other novels as well, and even the picture book The World's Greatest Freak Show).